My kids have everything and I will freely admit I’m a bit stumped this year over what to buy them for Christmas. 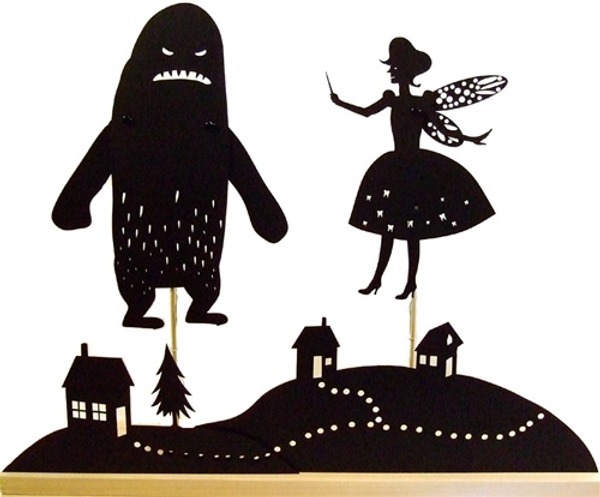 I’m so glad Monkeytail and Wellington have just restocked these amazing Owly Shadow Puppets in time for gift buying! With prices starting at just $15, you can buy the Shadow Puppet Theatre Screen, along with a whole host of options for story making, such as a fairy, a yeti, a mermaid, dinosaurs, robots and owls. For a fascinating interview with Owly’s creator Andrea Everman, duck over to Monkeytail and Wellington’s blog. If you are wondering how her life path led to shadow puppet making, she started out making those tiny models of building complexes you see in apartment sales showrooms. I find it absolutely charming that she used to plant tiny objects within them, or decorate the walls of an old mansion with pictures of ghosts. It’s this sense of humour which translates so beautifully to puppet-making and your children will have many hours of imaginative fun. Another enticing aspect is that it is suitable for children of many ages. Order now from Monkeytail and Wellington.